Weather conditions can play a role in the material that you decide to build your garage with. For example, if you live in a tropical climate, such as Florida, the weather is typically on warm. However, it is damp because of the amount of rain and humidity that is produced annually. Knowing that you live in these conditions, it is beneficial to take precautionary steps by protecting your garage with a steel door in case of intense storms. There are a variety of options in which you can decide to build your garage with depending on your city’s temperature and climate. You may want to install fiberglass or a plastic garage door in warmer climates. Fiberglass can be useful if you live in a sunny region near the ocean because the material is light. This material is also low-maintenance. However, it may fade over time as it ages and from the sunlight. Protecting your garage from the freezing temperatures during a Chicago winter can take a good amount of preparation. One way to prevent any damage is to install a wooden door to your garage. This will be useful when winter rolls around, the temperature is below zero, the winds are 30 mph, and the snow is blowing against the side of your home. Placing installation on the walls and roof of your garage can also help keep the temperature warm. Steel is a durable and strong material option for your garage door if you live in a windy climate because it is less likely to warp or fall apart. Another plus is that steel does not require a lot of maintenance and can be added to keep your house at a comfortable temperature all year round. Another option is to build your garage with an aluminum door. Although this is an expensive choice, it will be beneficial down the road. 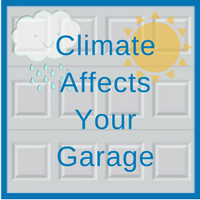 It is important to consider your type of climate when trying to decide what kind of material you should build or redesign your garage with. Depending on the weather conditions, you may need to install a particular type of door or installation to your garage. Please contact one of our Chicagoland area garage experts at Blue Sky Builders for more information on different types of garage materials or other maintenance needs. Call 630-852-8485 or visit us online, today.